For part two of the hair covering discussion (can you say “controversial”? ), I’ve polled women of all kinds on their feelings on hair covering – why they cover, or not; with what and when; and how it makes them feel. I still have not heard from a woman who does not cover her hair as to why she doesn’t, so open invitation for that, but here’s a sampling of the responses I’ve received, including a woman who isn’t Jewish (see Kajsa’s response at the end). Note: the word “tichel,” not to be confused with “kichel,” is a Yiddish word for kerchief. 1. Do you cover your hair? 4. Did you always know, growing up, that you would? 5. What is your preferred method of covering your hair – wig, scarf, hat, baseball cap, or any old thing will do? 6. What influences your answer to #5? 7. How has covering your hair, or lack thereof, impacted on your identity as a Jewish woman? 4. No, I really thought I would not until I was about 18. I had really only been exposed to one type of covering and it did not appeal to me. 5. I prefer hats or scarfs as they are more in line with what I believe in philosophically and serve the purpose of #2. I do own wig that I wear for work or for occasions that it seems more appropriate. 6. The community I live in, the community I work in and the community I socialize in. 7. Covering my head has really been a huge part of my Jewish identity and I am very proud of the commitment I have made to do it. I certainly have also been misjudged based on it both favorably and unfavorably depending on the circle I am in and the type of covering I happen to be wearing. I hope I can use those opportunities to grow. In either case, covering my head helps make me feel connected to G-d, my husband and my family on a daily basis. 6. What influences your answer to #5? When I wear beautiful scarves, several of them at once, I feel regal and connected to the earth and to GD more so than when I cover my hair with a wig. I often think that this is what our foremothers wore, back in the day, which makes me feel a connection to them, too. In order to carry the scarves, I find that I need to wear earrings and makeup which forces me to ‘dress’ in the mornings, I feel like when I’m put together with scarves (or a wig) all day, my house is holier, calmer, more positive, and everyone behaves better actually, as opposed to when kids and husband come home and I’m in a snood etc. My kids and husband are happier when I’m dressed. I see their pride that their mommy/wife looks beautiful. I totally believe that it affects the energy in my home, for the good when my hair is covered. Also, I am more aware of myself as a Jewish woman, publicly, when I wear scarves or my sheitel which impacts my actions – from the way I speak to others to the way I carry myself around town. When I’m in a kiruv setting, I tend to wear the wig as I’m not as confident with the scarves in that setting. I ‘blend’ in better with the wig. Everyday and on shabbos, for the most part, I’m in lots of scarves with bling. I love the looks (is that crazy?) that I get when I wear multiple scarves because here in Denver, it is unusual and I get tons of compliments – boosts my ego, I guess. 7. How has covering your hair, or lack thereof, impacted on your identity as a Jewish woman? See above. like to wear sheitels because I feel polished and pretty when I wear them. wearing a tichel or something that more visibly identifies me as Jewish. all of my hair is really covered. friendlyish.” It just depends on the vibe of the place. that I’m representing something bigger than myself. I cover my hair with scarves/tichels, etc… Only. Jewish women. We need to rock it out. I’ve learned since I was a young girl that married women must keep their hair covered. &6. I wear a wig, 24/7!! Growing up, I rarely saw my mother without a wig. Do you cover your hair? Because the Torah/our Sages told us to. always included covering my hair. hat, baseball cap, or any old thing will do? sheitel…you don’t forget that it’s there!! growing up in anti-semitic neighborhood in Canada). my answer on your questions. objectified by men and society. gym (swim cap when swimming). that will encourage me, pray for me and laugh with me whenever I need it. has been happening since I’ve been wrapping…men treat me like I’m BEAUTIFUL! And how would you answer the questions? In my community, covering one’s hair is de rigeur for married women, and mostly that’s done with a wig. Lots of us cover our hair more casually, like with a chenille snood or pre-tied bandanna, but that would be akin to changing into your sweats. Like, if you’re “dressed,” you’re also wearing a wig. But in my recent trips to Israel, I’ve become more and more gaga over these beautiful scarves that women wrap their heads with. They are just magnificent. No yoga-pants-look here. These women are dressed. There is just something about the sheer authenticity of covering one’s hair with a scarf that grabs me. And so, with the help of Wrapunzel and their cool YouTube tutorials, I’m wrapping more and more. I’m not ditching the wig anytime soon. There are plenty of community occasions where I’ll feel more at home in a wig – but my heart is with the scarf, no question about it. I’ve polled some women on the matter, including some of the lovely women on the Wrapunzel Facebook fan group (a sizable minority of whom are not Jewish) and got some great responses, which I’ll share with you in my next post. But first, here’s this chart. It shows my personal, and I repeat, my personal, opinions comparing wigs and scarves in various categories. Commentary is below. I’ve rated each category on the basis of a 5-star system, with 5 stars being awesome and no stars being abysmal. You know, like hotels, except no one gives hotels zero stars, though they sometimes should. Comfort: Some might find wigs more comfortable. Not me. If they have bangs, they look more natural, but then they’re always hanging in your eyes. Grr. Scarves, done right, stay put, out of your face and off your neck all day long. I can see and be seen! Price: Yes, I know you can buy really cheap wigs. Cheap wigs look like cheap wigs. Scarves are so cheap it’s funny. Especially at the Israeli shuk. Aesthetics: Again, this is personal preference. To my view, what makes a wig beautiful also makes it inauthentic. A beautiful wig that’s also modest? Ummm. Scarves are beautiful and modest at the same time – that elusive blend I’m always seeking. Anonymity: This is a biggie, especially for those in mainstream professions. If you need to blend in professionally, a wig is going to be a necessity. On the other hand, there is something about outing myself as a religious Jew in public that I am finding incredibly liberating (no faking) and also giving me a much greater sense of responsibility in terms of being an ambassador of my faith. Overall, it’s a little scary and very exhilarating. I like it. Ease of use: I gave these matching ratings, because some women find it very easy to just slip on a wig and very difficult to tie a scarf just right. Once it’s on, I find the scarf way easier. You don’t have to fuss or mess with it. Wigs always need to be brushed, flipped, and adjusted. Also, once you get the hang of wrapping, it’s easy. Maintenance: Wigs don’t require that much maintenance. Once a month (depending on frequency of wear) they need to be washed and done. Transporting them is a bit of a pain. 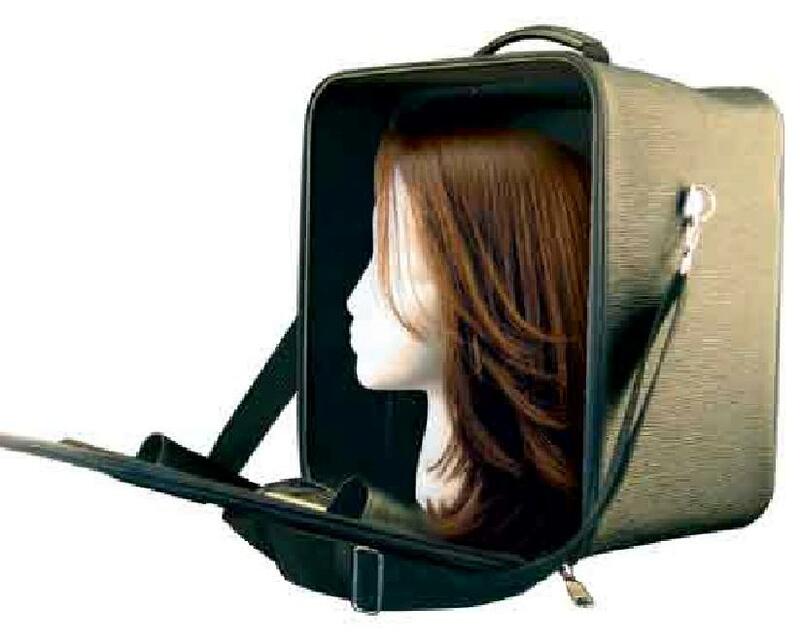 If my wig is done for a special occasion, I’ll transport it in a “shaitel box” (if we’re traveling for a wedding, say) but otherwise I literally toss it in a ziploc bag. No comparison, of course, to transporting a scarf. Duh. Religious preference: For most religious groups, with the notable exception of Chabad, covering one’s hair with a scarf is preferable. In some Sephardic circles, wigs are actually a no-no. The Chabad leader, Rabbi Scheerson, maintained that wigs were preferable for two reasons: one, if women felt beautiful they would more likely stay covered, and two, no hair shows out from under a wig, whereas occasionally hair can slide out from a scarf. Some of you may have missed “Finding Meaning in Terror,” my most recent post, if you receive notifications via email, since it appeared on the same day as an ad which appeared at the top of the email. Please be sure to check it out. Sounds harsh? This is a standard prayer that one might say when hearing of the death of a fellow Jew at the hands of a hate crime – of one who was killed for being Jewish. Last week, I included this short prayer at the conclusion of a Facebook post. One of the murder victims. His wife is a Markowitz from Cleveland. Rebecca Blech Schwartz, I am so sorry for your family. May his soul find rest and may God avenge his murder. I always felt good about the simple Jewish approach to vengeance: it belongs to G-d. We pray to Him to bring it on people who perpetrate evil, and we go through appropriate legal channels (including this incredible law firm) to bring about justice ourselves, but we do not take vengeance into our own hands. Then I read this emotional piece by my friend Sarah Rudolph, expressing resistance to using the term – and it really made me think. Revenge people-style, and revenge G-d-style are not the same thing. People-revenge is angry, instinctive, emotional, and anger-driven. G-d revenge is restoring justice to a world gone mad. I don’t want revenge, because I don’t want to become an ugly person. I want G-d to do it – because I know He’ll do it right. And I’m proud of a religion that knows the difference. Welcome back, OOTOB readers. With all the holidays over, the kids are back in school and I’m itching to blog regularly again! Since so many interesting things have piled up over the past month, I decided to do another blog roundup for my first post back. Firstly, happy anniversary to me and my wonderful husband (as one favorite commenter here calls him, Mr. Ruchi. We love that). We married 21 years ago October 18th on an absolutely magnificent fall day. I am supremely grateful for him and actually, he’s the support behind this blog and all the things I love to do. For my anniversary gift, I asked him for another year of being a great husband (together: AWW!). Don’t worry. I’m still angling for a trip to Florida too. I’m not THAT holy. WHY RELIGIOUS JEWS ARE RACIST? Next up, I found this really interesting piece about how people with Aspergers view the rest of us (nicknamed NTs, for “neurotypicals”). It really got me thinking about Jews who are racist, and especially why more religious Jews might be more racist. Sometimes racism is a response to discrimination, which is a result of being different – especially obviously different, as religious people are. Sometimes it’s a defense mechanism, to be okay with your different-ness. Tell me what you think. This is something I’ve long thought about. Why are women in America supposed to just bounce back after birth? The way I grew up, and even more so in more Chassidic families, a woman who gives birth is called a “kimpiturin” (that’s Yiddish) for six weeks, and is supposed to pamper herself and lay low and let others take care of her as much as possible. To be honest, I kind of chafed at this after awhile since I had easy births and was raring to go – but in retrospect, it’s a great invention, and a very necessary one. In the non-Orthodox world I see none of this. Women are out shopping and carpooling and getting dressed up so soon after birth (forget about going back to work). Living in Israel, I saw a much greater respect for the post-partum state than here in America. Why is this an Orthodox (and more Chassidic) thing? I have no idea. But there’s a definite difference. This is just one big “oy” and falls into the same conceptual category as kosher bacos, kosher-for-Passover Cheerios, and kosher cheeseburgers (fake cheese, fake meat, or both). It’s a Shabbos app so you can use your smartphone on Shabbos. I’m going to artfully dodge the actual halachic issue, and go with the assumption that it’s technically “kosher” according to Jewish law. I have found, over and over again, that non-Orthodox people are usually more sensitive to “kosher loopholes” than the Orthodox. To be sure, there’s a huge outrage among the Orthodox community about this app, since it’s something new and, well, outrageous, and because the technology piece of Shabbos makes Shabbos observance more contemporary than ever. Everyone who’s anyone is recommending a tech-Shabbat. But I’ve found that in the less-obvious areas, especially food issues, non-Orthodox people are more likely to detect the problematic mindset in finding legal loopholes. One could argue that those who live bound by halacha deserve and should celebrate the areas that they can find loopholes in – “easy for you to say” sort of thing, to the non-Orthodox. Others feel that Judaism is a relationship, an attitude, and that looking for loopholes in relationships does not a good relationship make. I myself adopt both attitudes, depending on the issue. I’m not a fan of the kosher cheeseburger thing, for example. But that’s for me. For others it’s important to eat what they can find permissibly, and it will make it easier for them to keep kosher properly in the long run. So that’s all for now, folks. See you in the comment section! Quick poll: how many of you are fascinated by the Amish? I used to think it was my Orthodoxy and my identification/feeling of “otherness” that drew me to the Amish, but then realized that many of my fellow MOTs, Orthodox and otherwise, feel the same way. I know how I feel when I read a book or see a documentary about my culture through the eyes of others (unfortunately, there is no documentary about the Orthodox, made by the Orthodox). Icky, that’s how. They never really get it right. So I’m wise enough to be skeptical when I see or read such stuff about other cultures. I know they’re not hitting the nail quite on the head. A couple of months ago, my husband and I were in Amish country checking out a bed-and-breakfast for a possible retreat weekend with our organization, and in the room was a book called “Growing Up Amish” by Ira Wagler. I flipped it over and saw that it was a memoir written by a man who tried, multiple times, to remain in the Amish faith and ultimately left. I wanted to plop right down in the rocking chair and read it, but couldn’t, so I made a mental note to READ THAT BOOK. It was a first-person memoir. It was about someone who, while he ultimately left the fold, did so without extreme anger or bitterness. It was a beautiful portrait of the faith without a “tell-all” expose, tabloid feel. And at the same time, it was honest about the struggles inherent in the culture. So when a friend sent me a gift certificate to Barnes & Noble as a gift (props for people who know just what to get!) I straight up and ordered the book. And finished it in two days (and was an ineffectual mother during said two days). I can’t possibly convey all that I loved about this sad and beautiful story, but I will say this. The whole time I was reading the book, I was comparing Amish life with Orthodoxy, and actually more, Hasidic life, which has more in common with Amish life. There similarities and so many stark differences. I’m not qualified to comment on Hasidic life since I’ve never lived it, but I do know more about it than your average Jew, so I’ll go out on a limb. The similarities are obvious, at least the external ones. Distinctive dress for both men and women. Restrictions in terms of modernity and mixing with outsiders. Clear roles for men and women. Variations in rules and customs depending on individual community – where some are considered too strict and some are considered too lax. Clear expectations and protocol regarding dating and marriage. But there are some pretty major differences. One of the main ones is that it didn’t seem from the book that the religion had too many daily responsibilities. Meaning, it certainly impacted daily life from the way you dressed to the way you transported yourself and to your profession of choice (farming). But in religious Jewish life, you have religious things you do, on your own and not just communally, every day from the moment you open your eyes in the morning, to your meals that you eat, to what you eat, to prayer services (for men) three times a day. It seemed from the book, and again, it could be the book just didn’t express it fully, that you had your prayers in the morning after breakfast, and then you were busy with your chores all day. Sunday was church to be sure, and there was the weekly “singing” which was religious in nature. I say a prayer the moment I wake up and every time I come out of the bathroom. I constantly choose kosher food. I monitor my speech to make sure it’s not disallowed for being mean or untruthful. I say “please God” and “God willing” in my daily conversation. I give charity every time I get paid for something. I pray myself whenever I can – and it was actually Ira discovering this personal, spontaneous form of prayer that ultimately saved his relationship with God. I’m not saying this is better or harder or anything. It’s just a stark difference that I noticed. Also, there was a huge difference in holidays. The book didn’t mention Christmas or Easter or any religious holiday, even once. I don’t know why. But Judaism is pretty much always either recovering from a holiday or preparing for one. There are the famous ones like Rosh Hashanah and Passover, and also the lesser-known ones like Shemini Atzeret, Shavuot, Tu B’shvat, Rosh Chodesh, and what-have-you. There’s always a holiday, and it’s a huge part of our lives. Schooling was another big difference. In Orthodox Judaism, and especially Hasidic Judaism, school is completely bound up with religious life. It’s daily, it’s long (dual curriculum) and it continues for a long time. In Amish culture, school seemed to be just school and not tied to the religious system or community. It didn’t seem as though the Amish attend school after eighth grade either, as they are needed for farming, but I could be wrong. In Orthodoxy, school is so inextricable from the religious system that if a child has a bad experience at school, it almost always creates a conflict in that child’s religious identity. And religious Jews are expected to always continue their religious studies, no matter how old they get – boys and girls. Whether it’s in the form of post-high school Israel programs, or less formal lectures available in one’s community, or lectures available online or over the phone, ongoing learning for all is a very prioritized value. Outside of church, I didn’t pick up on any of that in the book. One very difficult part of the book to read about was the stoicism that the author describes in his community. When he experiences tragedy (no spoilers) and his parents experience the pain of their children leaving the fold, expressing one’s feelings is taboo. While all families operate differently in any culture or religious system, it was indicated by the author that this stoicism was definitely inherent in Amish life. Orthodox Judaism, and even more so Hasidic Judaism, does have some degree of communal protectiveness where it’s taboo to openly admit your problems and failures, but I was struck by the contrast between Amish living and Jewish living in terms of dealing with tragedy. In Judaism, you have the broadest gamut of emotions built into the calendar and even into the prayers. There’s Orthodox funerals, where everyone is openly crying. There are Orthodox weddings where bride and groom are very likely sobbing in prayer under the chuppah. There’s the wildly ecstatic Simchat Torah celebrations and intoxicatedly joyous Purim parties. There’s Tisha B’av, where we cry for Jerusalem and for personal tragedies. There’s Yom Kippur, where we cry in repentance for our misdeeds. People get choked up when they speak at bnei mitzvah and weddings. We get together for impassioned and tearful prayers for Israel. Wow, it’s just so different. On a sort-of tangent, one of the most depressing parts of the book was where Ira expressed his need to process his depression and about how therapy was absolutely off-limits. I’m pretty sure it was like this in Orthodoxy till recently (but that’s true of the general world). The stigma is receding in terms of accessing help, but probably not in terms of admitting that one needs help. And we still have a long way to go because one of the features of Judaism is perfectionism. Not just in the religious community but across the board – although religious and secular Jews perfectionize about different things. Secular Jews perfectionize more about academics and religious Jews more about who they marry, but either way it’s a Jewish trait, so being imperfect and experiencing depression and seeking therapy are still far more taboo than they need to be. Smartphones are a perfect example. Smartphones afford unlimited access to the internet, with all the good, bad and ugly that that includes. We are very mindful about introducing that kind of technology into our homes and into the hands, particularly, of our impressionable kids. While smartphones have definitely made themselves comfy in many an Orthodox home (including mine), we are very conscious about its pernicious influence whether in religious philosophy, language, immodest images and themes, and music that is antithetical to spirituality. So for us, it’s not modernity in and of itself that’s problematic, but rather where that modernity will take us in terms of Jewish observance, belief, and values. In some ways I envied the Amish while reading the book. Their plain and simple life without cars and technology, while gritty, seems far less complicated than mine, with my carpools and constantly pinging phone. But the grass is always greener elsewhere. Would I really rather spend my time churning butter? Not so much. More to discuss, for sure, like the marriage system, authoritarian parents, and kids who leave. Read the book, and weigh in below. I’d love to hear. Although the Jewish world is still reeling from the murders of the three Israeli boys, there have been lots of other things cooking on the interwebs. Orthodoxy’s first female [fill in word of choice here] came to Cleveland to speak recently, sparking locally a huge wave of controversy that is brewing within the larger Orthodox world. Here’s another response to the issue in general. As an aside, I find it interesting that while in English, our language is moving more toward gender-neutrality, Hebrew will never be gender-neutral. Therefore, while in English, the word “rabbi” has been broadened to include women, in Hebrew a new, gender-specific noun must be chosen, and what that noun will be is still under debate. …another important question that I believe is underlying this entire discussion. It also will clarify why I don’t have a problem with men running the show in established clergy positions. That is: are you willing to accept the status quo in normative Orthodox Judaism, or are you seeking to push the boundaries to where they have not been before? I am not casting aspersion on the second option, but I will say that if your starting point is that women should have as great a role as possible within clergy then no one should be surprised when that endeavor is met with resistance and push back. I accept the status quo and proceed from there. I don’t feel I ever got mixed messages since we didn’t learn Gemara as a subject as I was never taught that men and women do the same things. Am I stupider or happier? Pathetic for not questioning and pushing the status quo, or more fulfilled internally for it? I guess everyone can make their own judgments. I’ll say this. I feel that I am reaching my potential as a Jewish woman leader doing exactly what I’m doing. I find no boundaries or frustrations. That is my experience, for whatever it’s worth. Grab some tissues, because you’ll need them for this. Seriously, is there ANY country like Israel??? Not specifically Jewish, but this was a good piece of mussar – wisdom that helps remind you why you’re here on this earth. I found this video interesting from a Shabbat-observant perspective, of course, but a little cheesy from the Oprah perspective. I like Oprah a lot actually, but what does she mean she didn’t “know” Sabbath was on Saturday? Wouldn’t you just say you didn’t know it was “originally” on Saturday, until Christians changed it to Sunday? There was one line in there that I loved – something like, if a door opens for you, and your faith doesn’t fit through that door, don’t walk through that door. In any case, this is a cool guy (who is apparently famous) standing up for his religious values in Hollywood. Thumbs up from me, for sure.